After years of study, the city's transportation department has released its suggestion to revamp Guadalupe Street. The City of Austin has unveiled its pitch to revamp Guadalupe Street near UT campus in a plan that favors bike- and bus-minded improvements. The proposal suggests whittling down the four-lane street to two lanes from 29th Street to Martin Luther King Boulevard and eliminating on-street parking along the Drag. If that doesn't sound like a plan to improve car travel near campus, that's because it's not. 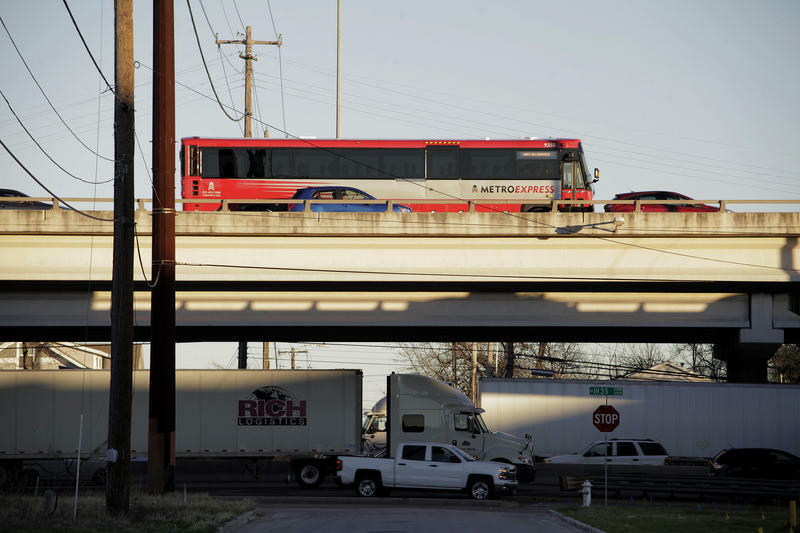 The Austin Transportation Department says the $33.7 million-proposal would, "not improve auto travel, but increases people throughput by improving the transit capacity and sidewalk width." 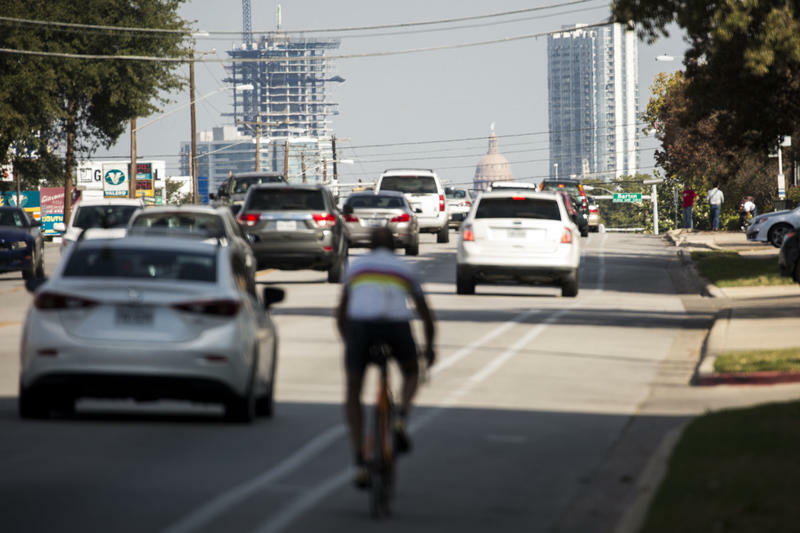 Along with reducing car lanes, the plan also gets rid of about 70 on-street parking spots, and reclassifies a lane on either side as a dedicated bus lane for the 20 Capital Metro routes that make an estimated 1,400 trips along the road daily. It also suggests redirecting car traffic from the West Campus off Guadalupe by converting Nueces to a two-way street north of 24th Street. Additionally, the plan would build out more bike lanes in the area. It would build east and westbound bike lanes on 24th Street between South Lamar Boulevard and Guadalupe. The report also suggests building another protected bike lane on Guadalupe going north (the city built out the southbound lane in 2013). The northbound lane would continue to 29th Street, while the existing southbound lane would use Nueces to connect to 29th. The plan culminates a years-long effort to study the Drag in the hopes of relieving gridlock along the roadway, while also accommodating the estimated 2,000 vehicles and 7,500 pedestrians sharing the road during rush hour. A city bond initially funded the study in 2012. Then, the city approved a plan of action for the study in 2013. 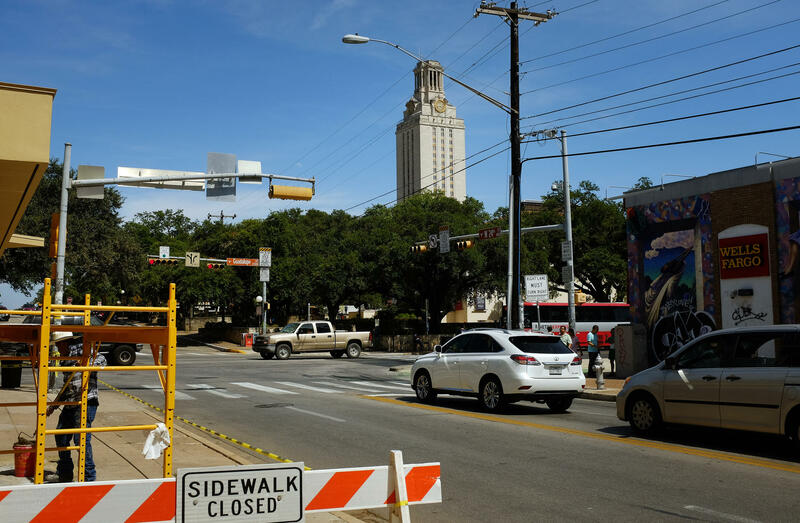 The city then partnered with CAMPO and UT-Austin’s Center for Transportation Research back in 2014 to use traffic data to model the best possible mix of designs to accommodate cyclists, pedestrians, drivers and public transit. In 2015 and 2016, the city held public outreach events and put out a call online for suggestions, asking Austinites how they envisioned improvements to the Drag. And, last year, the passage of the city’s $720 million transportation bond gave the city the means to pay for a Guadalupe revamp. You can read the plan in its entirety below. Austin’s got a checkered past when it comes to digital road signs. The blinking roadway signs have been hacked a few times in the past to warn of zombies, to taunt the OU Sooners and to even pay tribute to the meme-launching death of Harambe. But the City of Austin Transportation Department has decided to harness that creative energy for good, by allowing anyone to submit safe-for-work language for road signs starting today. City and state officials are really good at counting cars to see how terrible traffic is and how it got that way, but that sort of data collection doesn’t exist for bike and pedestrian traffic. New research hopes to change that. The Capital Metro board has approved a major overhaul of its bus system, affecting more than half of all routes in the area. The vote was 6 to 2. While some buses will run more often, other routes will be eliminated. The changes will go into effect June 3.